Public schools. A cornerstone of America is our "common school" — free, publicly supported schools open to all children regardless of social class, religion, ethnicity, gender or country of origin. America forged the very concept of universal education. Governmental accountability. Where public money goes, public accountability should follow. Many Americans are alarmed at proposals to de-fund public schools, where 90 percent of students are enrolled. Proponents of vouchers, in openly seeking to "privatize" education, are attacking treasured American principles. The 25 voucher programs in 14 states as of early 2017 divert ever more taxpayer funds from public schools. Yet such schools remain free to exclude students, disregard regulations, provide little accountability and indoctrinate students at public expense. The vast majority of private schools are religiously affiliated. Vouchers and tuition tax credits almost entirely benefit religious schools with overtly religious missions, which integrate religion into every subject. The lack of oversight of voucher schools encourages widespread fraud and mismanagement. Taxpayers cut the checks to voucher schools, yet have no say in how they are run. Public schools are managed under democratically elected school boards that assert public oversight. Citizens have no means to review voucher school records, attend meetings, or otherwise gather information about school operations or provide input. Voucher schools have minimal testing and reporting requirements. In Milwaukee, voucher schools operated for decades without taking statewide tests. Once testing began in 2011, results showed that public school students outperformed voucher students. (9) Public schools, while often being defamed as failing by voucher advocates, have been held to far higher standards than voucher schools. 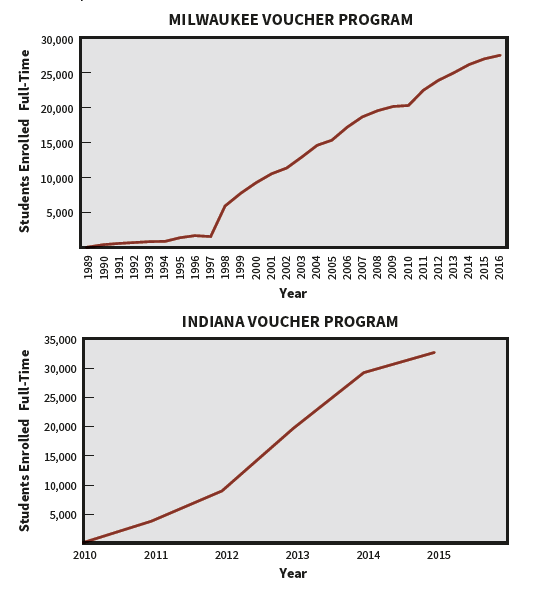 Vouchers increase taxpayer costs. School vouch-er schemes take money from our public school system and funnel it to private schools. The voucher movement is not truly championing "choice" or lifting up disadvantaged students or students of color. It is using disadvantaged youth as pawns in a cynical ploy to divert funds from public schools to private, mostly religious schools. Current federal proposals even call for raiding Title I funds intended for support of low-income students to give to private schools. How do unregulated voucher schools operate? Adopting "science" curriculum that claims to refute "the man-made idea of evolution." President Donald Trump, in his March 1, 2017, address, urged Congress to pass federal tuition tax credit vouchers. The situation in Arizona, which has one of the oldest, largest tuition tax credit voucher programs, is a cautionary tale, where students receiving them increased from 50,000 in 2005 to 256,000 in 2017. Arizona taxpayers or corporations may donate money to nonprofit voucher-granting groups, then claim a 100 percent, dollar-for-dollar credit against their state taxes. (E.g., if you donate $1,000 to the voucher nonprofit, you subtract 1,000 from your taxes.) The nonprofit transfers money to families to pay for tuition at private schools, but may keep 10 percent to pay overhead. Over $100 million per year is given to finance vouchers for private schools. Circumvent strict state constitutional prohibitions against public subsidy of places of worship and religious schools. Allow private schools benefiting from credits to avoid governmental regulations that may be imposed on direct voucher schools, such as teacher licensing, state audits, test score comparisons, etc. Divert millions of dollars from education to bureaucracy, such as the "10 percent" rule in Arizona for over-head. Encourage "self-dealing" abuse, wherein parents finance vouchers for neighbors, who reciprocate (a practice outlawed in Arizona, but once widespread). Encourage private schools to raise tuition to take advantage of new funding. Permit taxpayer subsidy of well-to-do students, such as occurs in Arizona (varying by state). Permit taxpayer subsidy of education deviating from accepted academic standards. Among tax credit recipients is Northwest Christian School, with 1,300 students in Phoenix, whose science and social studies curricula were developed by Bob Jones Publishers, a major promoter of creationism. Already 17 states off er some type of scholarship tax credit, according to the National Conference of State Legislatures.25 Other schemes include direct public tax credits or deductions for families with a child attending a private school, and education savings account that may be used to pay for private or religious school tuition, or even make all gains free from federal taxation. Decisions on education funding and policy have traditionally been left to state and local governments. The Trump proposals would involve massive federal interference in state and local governments. 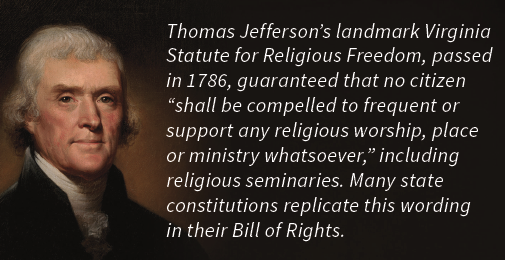 Many state constitutions wisely prohibit the state from providing aid to religious schools. Federal voucher legislation must not infringe on these state constitutional protections. Our public school system is a pluralistic institution where all students are welcome regardless of their background or religion. Voucher schools are heavily segregated on the basis of religion. Voucher schools have few barriers to prevent them from discriminating in hiring or student admissions on the basis of religion, sexual orientation or disability. In contrast, public schools must provide a free and appropriate education to all students, including those with disabilities. Voucher schemes are a backdoor means of funding religious schools with taxpayer money, undermining the principle of separation of state and church. They benefit those denominations that have the most private school infrastructure in place.